I've watched this anime several times around when it came out and again when, to my pleasant surprise, it came onto crunchyroll. I usually don't rewatch anime or write reviews, but this series is probably my favorite romance anime of all time. What's to love about this series? It's a breathe of fresh air from most romance anime that's filled with harems, half-assed relationships and has more hi-res fanservice than plot. This series focuses on a romance with a touch of comedy and sorrow that pulls at your heart strings without ripping them out. At 6 episodes it may not be long but what's important is not how long it is, but how good it is. Highly recommended to anyone who enjoys romance, especially if your looking for something good without 20 episodes of plot-less filler. Hantsuki is, in essence, a straightforward romance. There are many things that I could say with all honesty were not the greatest, but all of that is overshadowed heavily by the depth of every one of the few characters paired with the literary feel of the entire story. Watching is an experience that feels akin to seeing a book be written from start to finish, in all of the best possible ways. To sum up the series in a word, I'd have to say "Bittersweet". There is happiness, but as the title of this review would tell you, it is a happiness with a time limit. Hantsuki subtly pushes this through the lines of Rika's novels and the stories of every character. If you want a no-extra, to-the-point series that leaves an impression, then Hantsuki is by far the choice. There is no comparison to it. Short and Sweet. Very good. I love romance in anime, and this show is pretty much just that. Anime in general has a lot of extra stuff added on to the core plot. Lots of side-characters, subplots, etc. that can drag a show on for many episodes. While I like that, and enjoy countless shows that do that, this show is a nice break from all that added filler. Just 6 episodes of the core plot, nothing else. I really liked this show; I've seen it 4-5 times. Hanbun no Tsuki ga Noboru Sora is an excellent tale of love and romance. It is a bittersweet series but nonetheless beautiful. When it comes to rewatchability I have found myself watching it over the years with its beautiful opening song and storyline it is worth giving a shot for those who like Air, Clannad, Ano-Hana. Simply put, terrific and heartwarming romance. Total of 6 episodes, went by way too fast, wish there was more. Would definitely recommend to anyone wanting a lovely unique romance story. 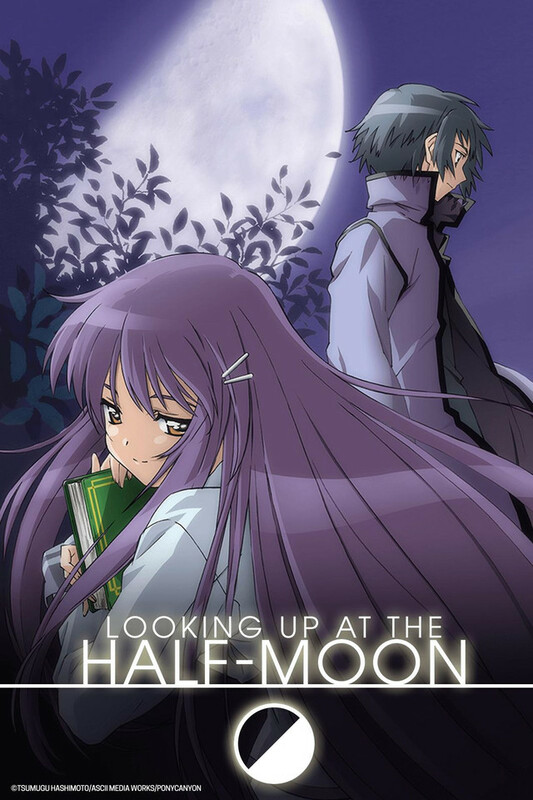 "Half Moon" suffers from too much drama in it's romance. The addition of the Doctor's sad life is a distraction from the main story. Which is usual dying character + savior character. Nothing new there or with dated anime style, and lots of uninspiring middle of the road aspects. The main nurse is the real star of the show. By far the most likeable memorable character. Really just a 3.5 show in my book. What a roller coaster ride this was. So, I wasn't expecting much when I added this to my queue just something to watch before going to bed. Well, I was wrong. I had work in the morning I was supposed to go to bed at a reasonable time, but this show had different plan. At only six episodes this series has only the core plot (romance) between the two star characters. It doesn't dive deep into every character's back story. Instead, it gives you just enough to give relevance to their intended role. This is a bittersweet anime that hooked and took me way my past my bedtime. Enjoy. I started watching this and quickly frowned. Huge lack of parental care for their sick children. Doctors obviously abusing patients. How did that doctor not get suspended/fired for beating up a sick child?! How did that even go unnoticed? Bruises dont vanish and being locked outside all night and no one blinks?? He's forced to deal with way too much for a sick patient himself and the girl doesnt seem to really care unless it hinders what she wants. I stopped watching because it wasn't a romance the more it went along but a series of abusive and manipulative relationships.